Hello everyone! I hope you had a great weekend! 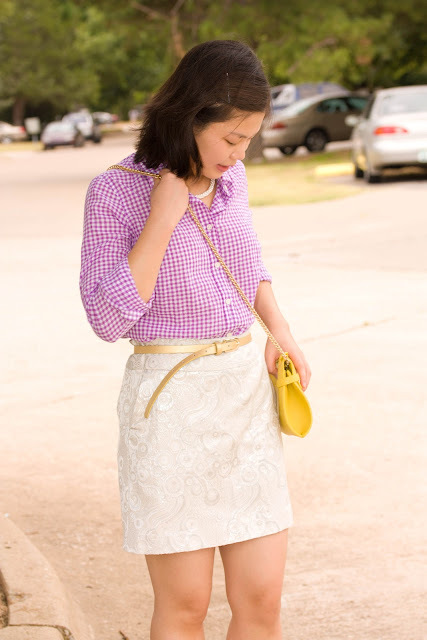 Today, I paired the purple gingham shirt with my favorite white skirt and yellow messenger bag. Thank you for reading and leaving comments! Love the skirt and smaal bag! I like that cute bag! so pretty.. im lovin the sweet colors and specially ur bag! Wonderful outfit, those shoes are fierce! Love that cute little bag! Goes very well with the rest of the outfit! I love the purse!! This is a very cute outfit!! Wow,lovely sandals! The purple is so fun to wear! Such a beautiful and classic outfit! I love that top! YOU LOOK SO CUTE!! !WORKED THE GINGHAM ON MY BLOG TOO AND PEOPLE LOVE IT! !GINGHAM IS THE BEST!!! hey nice look & great blog ! i love purple and yellow.look so great together! Everything looks so cute! And i really love your shoes..great colours. And if you like, lets follow each other :) let me know and i'll follow u back for sure. So cute! I love this outfit and that bag is too cute! Thank you all for the sweet comments! You made my day! thank you for visiting and following, we are following back!!! cute shoes!! really like the colour blocking! Very cute gingham shirt! Love the yellow accent! it´s amazing! Your style is co cute and original! Thanks so much for following :) i've just followed you on GFC too. nice mix! that purple shirt really looks adorable with the skirt. The skirt is our favorite! looove that top! is it recent??? Tina, I following you too. Thanks for following and i follow you back ;) ! Cuuuuute! hum and so adorably sweet. THankyou for following, always gives me a kick when I read that! haha. Following you back too hun on bloglovin ^_^ Hope you've had a wonderful week so far! cute bag, really cute sandals!! I'm now following...hope that you'll visit my blog and follow back if u like! I've also a new Facebook page, If I can click LIKE it would be awesome! 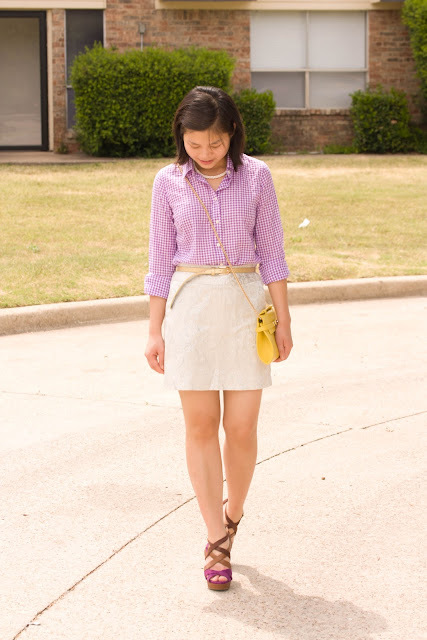 I really like this outfit because one doesn't usually see a purple gingham shirt, and you wear it classily. thanks so much for commenting and following my blog..following you also:)!! amazing outfit!you look so beautiful!follow you!if you if you want check out my blog! Great outfit! Those shoes are fab. Come and visit my blog, if you like it I would love it if you followed me. very interesting combination of colors. keep it on. hi, tina! i'm petite and asian, too! it's great finding bloggers like me. love your outfit here... love your sandals, and great pop of colors on a neutral palette. love that bag! enjoyed browsing--i followed both on bloglovin and google. i would be delighted if you connect with me on both, too! cheers and have a great day!